Colliers International’s Mike Mixer , SIOR, and executive managing director for the Las Vegas office represented the sale of 60 acres near the Las Vegas Strip. The land and apartment parcel is on the corner of Harmon Avenue and Koval Lane in the heart of the resort corridor. 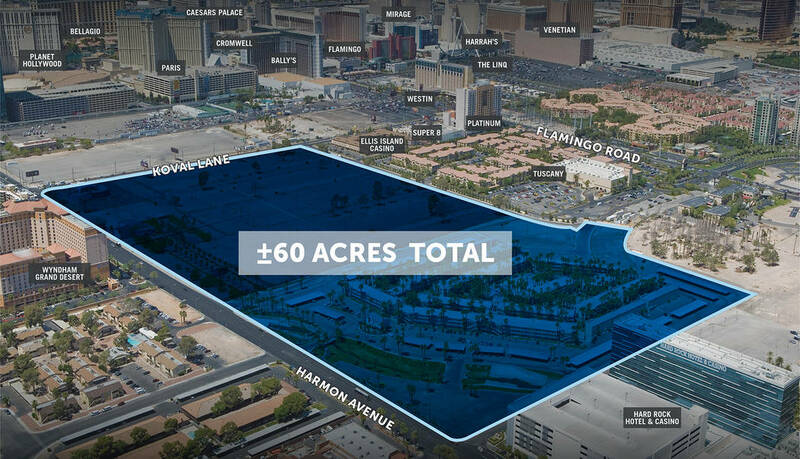 A 60-acre parcel of land near the Las Vegas Strip was sold for $130 million. The Calida Group purchased a 624-unit multifamily apartment community for $100 million. Colliers International’s Mike Mixer, SIOR, and executive managing director for the Las Vegas office represented the sale of 60 acres near the Las Vegas Strip. The land and apartment parcel is on the corner of Harmon Avenue and Koval Lane in the heart of the resort corridor. The sale includes the Harbor Island apartment complex that sits directly adjacent and to the west of the Hard Rock. The property is one of just a few large land sales that have been completed near Las Vegas Boulevard in recent years. The site is poised for a mix of high-density residential, retail and/or gaming/resort applications. 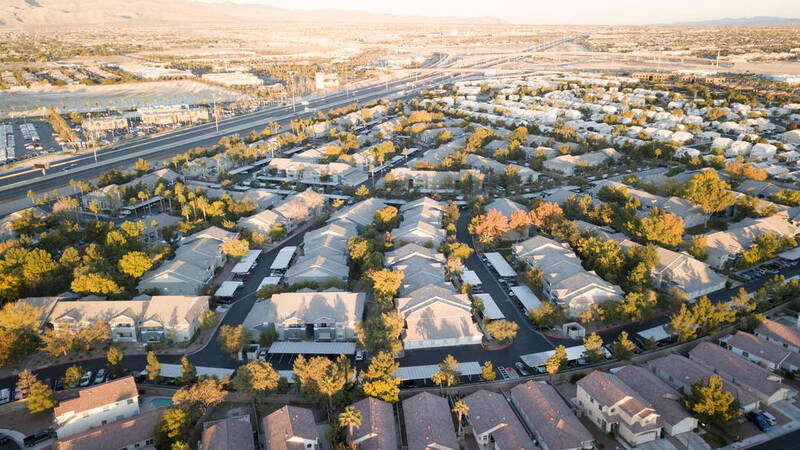 The Calida Group, a Las Vegas-based multifamily real estate development and investment firm, has purchased a 624-unit multifamily apartment community for $100 million. Point at Centennial, formerly Sky Pointe Landing, is at 5850 and 5900 Sky Pointe Drive. Shopoff Realty Investments (“Shopoff”), a national real estate company, sold it. Purchased in September 2016, the property is comprised of one-, two-, and three-bedroom apartment homes featuring 9-foot ceilings, walk-in closets, in-unit washer and dryers, private patios and detached garages. A value-add investment opportunity, at the time of acquisition, roughly 25 percent of the units had been renovated by the previous owner. “By bringing the percentage of renovated units at the property up to 50 percent, we captured significant rent increases, approximately 20 percent higher than the property’s average rental rate at the outset of the renovation plan,” explained Shopoff Realty Investment CEO William Shopoff. • A sale to Highland and Sterling LLC. The 85,134-square-foot retail and office property is in Scottsdale Plaza at 8716 S. Maryland Parkway. The transaction value was $11,500,000. Grant Traub, SIOR, and Chris Connell of Colliers International represented the seller, SREF Scottsdale Plaza LLLP. Chris Clifford, Steve Neiger, CCIM, and Brett Rather of Colliers International represented the buyer. • A sale to Becknell Industrial LLC. The 20.6-acre land parcel is on the northeast corner of Howdy Wells Avenue and Beesley Drive (APN: 123-34-201-005 and 006) in North Las Vegas. The transaction value was $5,200,000. Steven Haynes of Colliers International represented the seller, SYD-G LLC. Dan Doherty, SIOR; Pat Marsh, SIOR; Paul Sweetland, SIOR; Chris Lane, CCIM; Jerry Doty and Sam Newman of Colliers International represented the buyer. • A sale to Red Falcon Equity LLC. The 20,033-square-foot office property is in Tribeca Parc at 5330 S. Durango Drive. The transaction value was $4,900,000. Patti Dillon, SIOR, Taber Thill, SIOR, and Stacy Scheer, CCIM, of Colliers International represented the seller, IIP Durango 3 LLC. Brian Riffel, SIOR, and Tyler Jones of Colliers International represented the buyer. • A sale to Martin Schorr. The 34,354-square-foot industrial flex property is in Cameron Hacienda at 5320, 5330, 5340 Cameron St. The transaction value was $4,200,000. Chris Clifford; Steve Neiger, CCIM; and Brett Rather of Colliers International represented the seller, VTT-Cameron Properties LLC. • A sale to Neuro Vision LLC. The 15,163-square-foot medical office property is in Durango Medical Building at 3012 S. Durango Drive. The transaction value was $3,592,000. Alexia Crowley, CCIM; Grant Traub, SIOR; and Chris Connell of Colliers International represented the seller, CM & A Realty LLC. • Devin Lee, CCIM; Robin Willett; Jerad Roberts; and Jason Dittenber of Northcap Commercial Multifamily, announced the recent sale of Valley Vista Apartments for $3,308,000 ($103,375/unit). This sale consisted of 32 multifamily units built in 2004, at 2930 Mountain Vista St. This all-cash transaction was completed in 25 days, closing on Jan. 31. Northcap Commercial Multifamily represented the seller (Valley Vista Apartments, LLC) in this transaction. • The sale of an office building was completed on Jan. 29. The 14,111-square-foot property is at 2000 S. Jones Blvd. The total value of the transaction was $1,450,000. Lisa Hauger and Timothy Erickson of Sun Commercial Real Estate Inc. represented the seller, Harold & Phyllis Saltzman Trust and The Brodkin Group represented the buyer, Carmen Gomide. • Walker Digital Table Services LLC leased 14,415 square feet of industrial space in Hughes Airport Center at 1181 Grier Drive. Jake Higgins of CBRE represented the landlord. • Medical Services USA Inc. leased 8,462 square feet of industrial space in Hughes Airport Center at 1181 Grier Drive. Jake Higgins of CBRE represented the landlord. • A lease to Temperpack Technologies Inc. The 45,980-square-foot industrial property is in Nellis Industrial Park at 3940 E. Craig Road, suites 103 and 105. Dan Doherty, SIOR; Paul Sweetland, SIOR; Chris Lane, CCIM; and Jerry Doty of Colliers International represented the lessor, ICON PAC Nevada Owner Pool 3 Nevada LLC. • A lease to Canamould Nevada Inc. The approximately 28,800-square-foot industrial property is in Black Mountain Industrial Park at 150 Cassia Way, suite 300 in Henderson. Susan Borst, CCIM, SIOR; Dan Doherty, SIOR; Paul Sweetland, SIOR; Chris Lane, CCIM; and Jerry Doty of Colliers International represented the lessor, ColFin Cobalt REIT (Colony Industrial). • A lease to CCR Solutions Inc. The approximately 25,000-square-foot industrial property is in Blue Diamond Business Center No. 5 at 4120 W. Windmill Lane, suite 104. Susan Borst, CCIM, SIOR; Dan Doherty, SIOR; Paul Sweetland, SIOR; Chris Lane, CCIM; and Jerry Doty of Colliers International represented the lessor, Pacifica Blue Diamond V LLC. • A lease to Sunbelt Rentals Inc. The approximately 15,000-square-foot industrial property is in Sierra Business Center at 4420 E. Craig Road. Dean Willmore, SIOR; Alex Stanisic; and Mike Willmore of Colliers International represented the lessor, Old Pueblo LLC. • A lease to Sierra Live Productions LLC. The approximately 4,400-square-foot industrial property is in Hacienda Crossing at 5275 Arville St., suite 308. Dean Willmore, SIOR; Alex Stanisic; and Mike Willmore of Colliers International represented the lessor, FJM Vegas Holdings LLC. • A lease to RABLS Inc. The 2,961-square-foot office property is in Cheyenne Fairways at 8670 W. Cheyenne Ave., suite 110. Steven Haynes, Patti Dillon, SIOR; Taber Thill, SIOR; and Logan Etherington of Colliers International represented the lessor, Ali Forootan. • A lease to Kong Fu Noodle. The approximately 1,760-square-foot retail property is in Galleria Pavilion at 605 Mall Ring Circle No. 125 in Henderson. Scot Marker of Colliers International represented the lessor, CIII Asset Management. • A lease to Big Lots Stores Inc. The approximately 53,200-square-foot industrial property is at 2020 Mendenhall Drive in North Las Vegas. Dean Willmore, SIOR; Alex Stanisic; and Mike Willmore of Colliers International represented the lessor, Javse Realty Corp.
• A lease to Everi Payments Inc. The 35,185-square-foot industrial property is in Valley View Corporate Center (Phase IV) at 6165 S. Valley View Blvd., Suite F and G. Spencer Pinter of Colliers International represented the lessor, Valley View LLC. • A lease to Jonas Productions Inc. The approximately 8,600-square-foot industrial property is at 6225 Annie Oakley Drive, Suite A. Dean Willmore, SIOR; and Mike Willmore of Colliers International represented the lessor, Sino Science North America Photobiotech Inc. Alex Stanisic of Colliers International represented the lessee. • A lease to Allstate Insurance. The 1,301-square-foot retail property is in Lynden Square at 6125 S. Fort Apache Road, No. 210. Scot Marker of Colliers International represented the lessor, 6105 Apache LLC. • A lease to Express Auto Insurance. The approximately 1,050-square-foot retail property is in Green Valley Town and Country at 2837 N. Green Valley Parkway in Henderson. Scot Marker of Colliers International represented the lessor, Contstanino Noval LLC and Marverde LLC. Al Twainy, CCIM, and Jennifer Lehr, CCIM, of Colliers International represented the lessee. • A lease to Jesse Richt. The approximately 1,000-square-foot industrial property is at 6220 Dodd St., Suite C. Dean Willmore, SIOR, and Mike Willmore of Colliers International represented the lessor, Joel Silverman. Alex Stanisic of Colliers International represented the lessee. • A lease to Milliken Enterprises LLC. The 4,771-square-foot retail property is in Gramercy Commons at 5752 S. Fort Apache Road, suite 125. Chris Clifford; Steve Neiger, CCIM; and Brett Rather of Colliers International represented the lessee. • A lease to Ben’Zaa Cantina. The 3,779-square-foot retail property is in Village at Centennial Springs at 7585 Norman Rockwell Drive. Chris Clifford; Steve Neiger, CCIM; and Brett Rather of Colliers International represented the landlord, RH Centennial LLC. • Neapco Components leased 9,261 square feet of industrial space in Lamb Industrial Park at 4305 N. Lamb Blvd. Zac Zaher of CBRE represented the landlord. • Suncor Stainless Inc. renewed its lease of 8,016 square feet and expanded an additional 5,813 square feet of industrial space in Civic Center Corporate Park at 3896-3900 & 3904 Civic Center Drive. Zac Zaher of CBRE represented the tenant. • The lease with Prodigium Corp. was completed on Jan. 14. The 6,079-square-foot office space is at 2360 Corporate Circle, Suite 330 in Henderson. The total value of the transaction was $792,406.06. Sun Commercial Real Estate Inc. represented the tenant, Prodigium Corp. and Cushman & Wakefield represented the landlord, ANC Village View LLC. • The lease with Las Vegas Plastic Surgery Forum Inc. was completed on Jan. 23. The 3,195-square-foot medical office space is at 6140 S. Fort Apache Road, Suite 100. The total value of the transaction was $154,893.60. Adam Drake of Sun Commercial Real Estate Inc. represented the tenant, Las Vegas Plastic Surgery Forum Inc.
• The Lease with Summit Family Services LLC was completed on Jan. 28. The 2,134-square-foot office space is at 2535 W. Cheyenne Ave., Suite 105, in North Las Vegas. The total value of the transaction was $106,848.00. Michael Brazill and Edward Bassford of Sun Commercial Real Estate Inc. represented the landlord, Manpower Cheyenne LLC. • A lease renewal to FCS Automotive International Inc. The approximately 31,200-square-foot industrial property is in Craig Distribution Center II at 4340 N. Lamb Blvd., Suite 100. Dan Doherty, SIOR; Paul Sweetland, SIOR; and Jerry Doty of Colliers International represented the lessor, Roberts Ranch Venture LP. Chris Lane, CCIM, of Colliers International represented the lessee. • A lease renewal to One Stop Mailing LLC. The approximately 31,200-square-foot industrial property is in Craig Distribution Center II at 4340 N. Lamb Blvd., Suite 140. Dan Doherty, SIOR; Paul Sweetland, SIOR; Chris Lane, CCIM; and Jerry Doty of Colliers International represented the lessor, CDC RRV. • A lease to Suncor Stainless Inc. The 13,829-square-foot industrial property is in Civic Center Corporate Park at 3896-3900 Civic Center Drive in North Las Vegas. Dan Doherty, SIOR; Paul Sweetland, SIOR; Chris Lane, CCIM; and Jerry Doty of Colliers International represented the lessor, MCA Civic Center II LLC. • A lease to Advantage Business Communications. The 12,414-square-foot industrial property is in Airport Industrial Park at 3245 E. Patrick Lane. Dan Doherty, SIOR; Paul Sweetland, SIOR; Chris Lane, CCIM; and Jerry Doty of Colliers International represented the lessor, ICON PAC Nevada Owner Pool 3 Nevada LLC. • A lease renewal to Hearth & Home Specialties Inc. The approximately 10,000-square-foot industrial property is in Harsch Quail Industrial Center at 3555 W. Quail Ave., Suite A. Spencer Pinter of Colliers International represented the lessee. • A lease to Sunrise Cabinets & Flooring Inc. The approximately 10,000-square-foot industrial property is in Harsch Quail Industrial Center at 3555 W. Quail Ave., Suite D. Spencer Pinter of Colliers International represented the lessee. • A lease to Thomas J Hess, M.D. PLLC. The 3,460-square-foot medical office property is in Stonecreek Office Park at 5915 S. Rainbow Blvd., Suite 105. Alexia Crowley, CCIM; Grant Traub, SIOR; and Chris Connell of Colliers International represented the lessee.